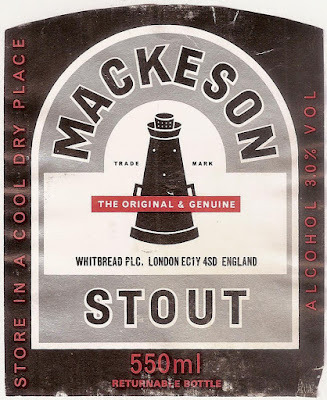 Continuing my series of post-WW II Whitbread Stout recipes, we’ve arrived at the granddaddy of them all: Mackeson. Why have I jumped forward a few years? There’s a very good reason. It’s all to do with how Whitbread added the lactose. It wasn’t added until post fermentation and doesn’t appear in the brewing log at all. I think it’s because of the deal Whitbread had with the excise on lactose. That effectively they didn’t pay any duty on the gravity die to lactose. By adding it after fermentation, it wouldn’t appear in the gravity reading taken for tax purposes before fermentation. Normal sugar primings added at racking time were taxed. For them, tax was paid on the gravity of the sugar solution in exactly the same way as for a wort. Getting back to my point, because of the way Whitbread added the lactose, I have no idea how much. But, I do have analyses of the finished beer. By looking at the difference in OG between that and the version in the brewing log, I can work out the quantity of lactose used. Simple, eh? The first post-war analysis I have is from 1954, so that’s the year I’ve picked. As for the recipe, it was the same as Whitbread Stout and Extra Stout with which it was parti-gyled. The only real change in the grist from the late 1940’s Stouts is the replacement of pale malt with more mild malt. The No.2 invert is in place of a proprietary sugar called Duttsons in the log. In the 1950’s Mackeson was amazingly popular. This probably comes from around the peak of its fame. Whitbread produced the beer in just about every brewery it controlled. It’s suffered a sharp decline since then but remains one of the few big bottled beer brands from the 1950’s that is still on the market. Oh. Nearly forgot. You’ll need to add caramel to get that colour. Here’s that lovely recipe . . . .
Just curious but do you know who made the proprietary invert syrups? Was it the sugar refiner or the brewer or someone else? the refiner. Thay all had their own brands as well as the standard inverts and other sugars. I've noticed that the Whitbread stouts are sparged at a higher temperature 170 than their pale ales and milds. Did Whitbread mash their chocolate malt or add it to the copper? I would think sparked that high with dark grains could pose some issues. Any reasoning behind the high sparge temps on the stouts? Can I request a picture of the original logs from time to time? I like looking at them and learning how you decipher them. Whitbread mashed their chocolate malt with the other grains. I'll see what I can do about the images.